Problems getting updates done on your website? Are you experiencing problems getting updates done on your website? Has your website been provided by a national company who forgot to mention that they outsource their service offshore? Now you can move on and enjoy the experience of working with a SAIF/NAFD member company and benefit from fast and friendly UK support. 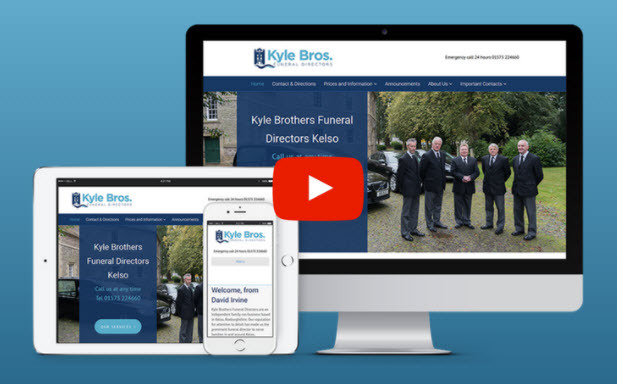 Your website will be a funeral industry marketing specific tool where you can choose to add funeral services that families value such as Funeral Announcements, Tributes, Donations, Testimonials and Bereavement Support. Take a look at our live demonstration here or contact us to find out more. The vast majority of our funeral directors achieve page 1 placement with Google on the organic search results (those are the trusted results based upon merit as opposed to advertising with Google). Not only can your website be found for generic funeral director searches but you can also be found when family or friends search for the upcoming funeral arrangements of a loved one. (We’ll be happy to give you a demonstration of this). Online reviews are now a fact of business life. We set up links from your website to encourage Google + reviews which can have a huge impact on your online reputation and PR. If you are experiencing problems getting updates done on your website contact us to get help.